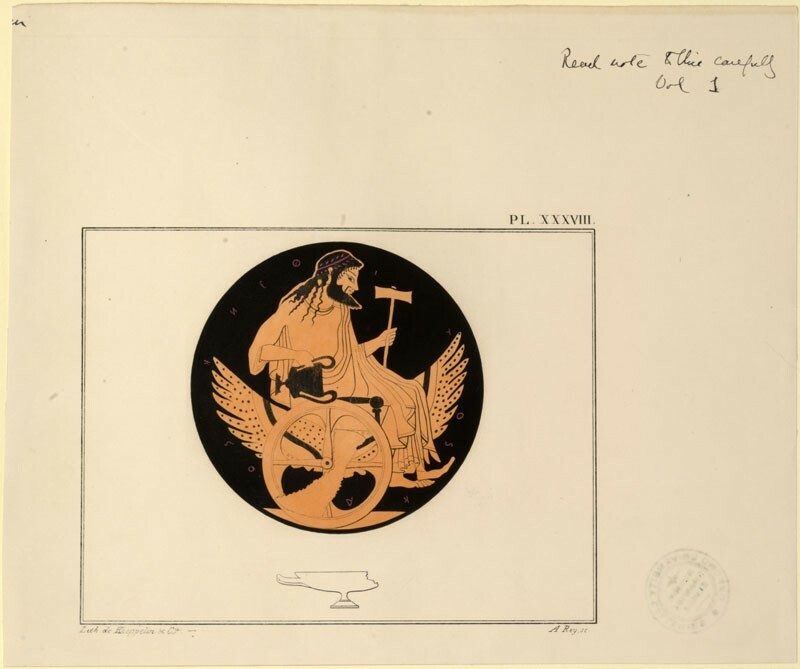 The lithograph shows Hephaestus, seated on a winged chariot, holding a hammer and a cantharus. It reproduces the decoration of a red-figure cylix, then in the collection of the Prince of Canino; a small outline depiction of the broken cylix, seen from the side, appears below the main image. It was plate XXXVIII in the first volume of Lenormant and de Witte's "Elite des monuments céramographiques", published in 1844. It was presumably taken from Ruskin's copy of the work now preserved in the Ruskin Library (inventory no. 1996B2621), which is missing many of its plates. The print was first catalogued by Ruskin in 1870, as no. 211 in the Standard Series, framed with two more prints from Lenormant and de Witte, of a black figure illustration of the birth of Athena, and another red-figure illustration of Hephaestus; they formed part of a series 'arranged chiefly with the view of showing the change in Greek conception of deity'. It retained its number in the 1871 catalogue of the Standard and Reference Series but, by the time Cook and Wedderburn were compiling their edition of the catalogues (published in 1906), the frame had been moved to no. 193. Cook and Wedderburn note (XXI.45 n. 1) that it carried its original number (211) on the edge of its frame, but the new number (193) on the face. Presumably, it was easier to engrave and attach a new ivory label on the edge of the frame than it was to remove or gild over the painted number on the face. According to Ruskin, the change in the ancient Greek conception of deity took place between the sixth and fourth centuries BC, and was marked by a development from conceiving of the gods as embodiments of physical forces to individual, characterised intelligences; from active to passive figures; and from grotesque to deliberately-selected beautiful depictions. At the same time, ceramic decoration changed from painting black figures on the red ground to painting a black background, letting the red ground show through in the figures themselves - though this soon led to careless execution. He believed the best vases were red-figure vases produced just after the transition (Catalogue of Examples, pp. 25-27; Standard and Reference catalogue, pp. 28-30). Ruskin described the print as showing 'Hephaestus as the Labourer, Aged', and it was presumably intended to show the development in images of Hephaestus. bottom right: A Rey, sc. centre, in graphite: Vulcan A.2. just to the right: Read note | to this carefully | Vol. 1. Beneath, as the labourer, aged and youthful.